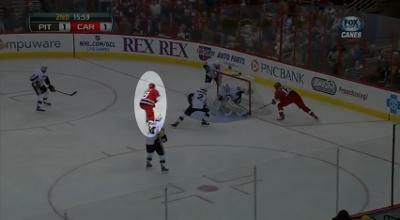 - Interesting to see another super dangerous combo.... Staal - Tlusty. (Tavares - Moulson, Nash - Gaborik)... Pens have Malkin - Neal, Crosby - ?????). Kunitz I guess???? I don't think most people mind a losing streak if they are still playing decent hockey and merely getting outplayed. I think there's a lot to see here, actually. Agree, this one sticks out like that Isles game earlier this year. Let's hope they rebound the same way they did after that happened. Martin did injure, or rather had his ankle injured, on that play. Not only was he tripped but then slashed on the ankle. 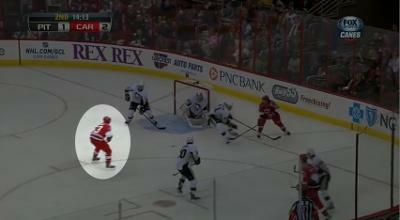 Is Malkin the only player capable of carrying the puck into the offensive zone? Powerplay looks like mud again, no clue what Letang continues to get 2:00 of powerplay time, every time. Last night even Martin got into the act, leading to a great chance at the other end. That's on the coaches. "Our focus has got to be on our work ethic and making sure it's there every night," center Sidney Crosby said. "We have to realize that we can't [just] show up and win." "We're a good team, but we're a good team when we work hard as a group. "We can't expect to show up in teams' buildings on the road and just put our gear on and expect to win." I don't want to hear any more comments like this from the Captain and the best player in the world. Glad I couldn't watch this one. suzinpgh wrote: "Our focus has got to be on our work ethic and making sure it's there every night," center Sidney Crosby said. "We have to realize that we can't [just] show up and win." He said those before the game, right? that's exactly what I want to hear from the captain...they need to work harder. What did he say that was wrong? His effort has been there, albeit he's not taking games over. Almost bought tickets to this one. Glad I didn't. Man, this team is frustrating to watch. At this point last year would you be thinking "I hope Martin is ok?". 1-One goal each in the last 25 seconds of periods 1 & 2. Killers. 2-Two posts hit by the Pens. No puckluck. 3-Lack of desire. Canes wanted it...Pens, not so much. Their gift to Jordan. 4-Pet Peeve about this game. It was (almost) all about Jordan Stall and his first time playing against the Pens since the trade. Brandon Sutter was in the same boat on the other side (duh). Hardly heard a word about that. And my perspective was from the Canes side as I was watching the NHL Network's feed (no other option). It was probably worse from their angle, but maybe not. Need Saturday's game vs Habs big time. Editing/adding here: TK needs a timeout/healthy scratch. Too many turnovers lately. Last edited by Big Easy Pens Fan on Fri Mar 01, 2013 8:36 am, edited 1 time in total. Any game the Penguins play without Despres in they lineup is a game where they (inexplicably) play without their top six defenseman in the lineup. Any game the Penguins play without having Letang and Despres paired together is a game where the defenseman are not put in the best situation to succeed. Stop the madness. Free Simon. - What the hell happened to Letang? He is brutal on the PP. - Loosing Martin for any length of time is far less concerning than loosing Malkin. Mr 71 has to come back soon. - I keep telling myself teams are not as bad as they look when they are loosing and are not as good as they look when they are winning. It's always in-between... I just haven't seen that yet and it is concerning me. - Kennedy looked like he was trying for once. - I am not excited for tomorrow night. The Canadiens are legit. Dickie Dunn wrote: Any game the Penguins play without Despres in they lineup is a game where they (inexplicably) play without their top six defenseman in the lineup. Love this post. I have no idea WHY Simon is being benched. Bertuzzo is not the answer IMO. For what its worth, I have heard from a reliable source not within the Penguins organization but definitely within an NHL organization and with ties to the Penguins that Malkin is ok.
Hawkeynut wrote: - What the hell happened to Letang? He is brutal on the PP. Trying & producing are two different things. actually all he said was "cliche, cliche, cliche". the last few weeks Crosby's defensive game has been lacking. 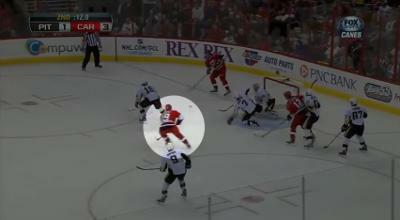 in the Flyers game he was the one who let Simmonds just walk out from the corner and shoot. last night he was one of the 3 Penguins too mesmerized by Staal's wrap around attempt and not taking a man in front of the net on the first goal. The defense was very soft. No rough and tough stuff with Cane players behind the net. The worst defense was played with NO COVERAGE in that soft spot about 5-7 feet in front of Fleury. NO GENO! Now are you goofy folks seeing the effect of missing a horrible, lazy, 3 year superleague russian, Evgeni Malkin? He make stupid decisions but he shoots, he produces and his Defense has improved this year. Should not lose to any team in that division. Definitely feel Shero will be active this year. Matt Cooke playing some great hockey one of the only pens who gave a 60 min effort. Get Letang off the PP, for all his skill he can't translate it into the PP. He has a great shot, he should sit on the one side of the ice and look for one times and if no shot pass the puck. -Bennett still playing on a checking line with Sutter and Kennedy while Jeffrey clearly has a better skill set to compliment his offensive talents? -Bortuzzo and Despres' development taking a back seat to Engo playing every night? -Kennedy playing no matter how badly things go for him? Bylsma's horrible management of young players while having and insane attachment to other marginal (At best) players that impedes actual talent development of said young players is my biggest concern. Not saying Bylsma isn't the right dude for the job but if I'm Shero and i see this go on for long enough, i trade away players like Engo and Kennedy just to protect Bylsma from himself. Still not seeing the TK hate, he worked hard and moved the puck the entire game. There should be a long list a players on the bashing list above him. His line had a lot of puck possession and could keep it in the O zone. Matthew Monstar wrote: The defense was very soft. No rough and tough stuff with Cane players behind the net. Look at the position of the Canes' goal scorers and how open they were... just brutal! Yeah no one is covering players on the ice, they are just chasing the puck. The defense is playing like pee-wee hockey. thepittman wrote: Still not seeing the TK hate, he worked hard and moved the puck the entire game. There should be a long list a players on the bashing list above him. His line had a lot of puck possession and could keep it in the O zone. Kennedy played well last night. Not bashing his last night performance. Bashing the body of work. Dude has made very poor choices for more than long enough to warrant the criticism.